Comfrey (comphrey, Symphytum officinale L.) is a fast growng perennial plant that is used as a fertilizer and as an herbal medicine. Every garden shouId have a comfrey plant. Find the details on how to grow comfrey, its nutritients, benefits and a recipe for making comfrey tea fertilizer for plants. The plant can be easily grown in average rich soil, but as it is very nitrogen hungry during the growing season, addition of animal manure and lawn mowing applied as a mulch will benefit it. Plant comfrey in a garden bed in sun or partial shade in spring or autumn, 30 inch apart. The plant is established in one year, remove any flowering stems in this period. The plant grows to about 2 feet height. You can harvest large leaves comfrey after first year for making comfrey tea or any other purpose. It produces huge amounts of nutrient rich leaves every year during the growing season up to mid autumn. The comfrey leaves are most potent in terms of the nutrients just before flowering. As comfrey leaves can irritate the skin, you should handle plant wearing long sleeves, long pants and shoes. Avoid taking cuttings after early autumn to allow the plant to build up winter reserves. The NPK (nitrogen : phosphorus : potassium) ratio of air-dried powdered comfrey leaves is 1.80 : 0.50 : 5.30 as compared to 0.25 : 0.15 : 0.25 for cow, 0.7 :0.3 : 0.9 for sheep and 1.1 : 0.8 : 0.5 for chicken manure. 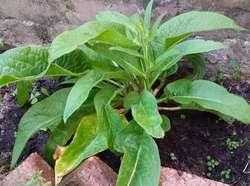 Thus comfrey tea is better than other fertilizers so far as the nutrients are concerned. Thus the comfrey beats the conventional manures. It has 21.2 times more potassium than cow manure and 10.6 times than chicken manure! Comfrey tea is rich in nutrients, specifically in nitrogen and potassium. The NPK ratio (nitrogen-phosphorus-potassium) of dried comfrey leaves is 1.8-0.5-5.3. The nitrogen is essential to promote leaf growth and potassium for flowers and fruit. Give comfrey tea regularly (every 3rd week) to plants such as tomatoes (growing tomatoes), chillies (growing chillies), blueberries (growing blueberries), bougainvillea, longan and strawberries, particularly after they start flowering. It is an excellent fertilizer for vegetables and fruits as well. Harvest comfrey leaves from established plants. Fill a container about half full of comfrey leaves. Press the leaves down by putting a small stone on top of the leaves. Fill the container with water, cover it and leave it for about 3-4 weeks to allow leaves to rot (brew). The water will turn into a dark color like that of green tea. Dilute this water to 40 - 50 percent and use it as a foliage spray or side dressing. You can add more leaves and water to the top to continue tea brewing. Comfrey leaves can be used as a compost activator in a compost bin to add nitrogen. Place a layer of comfrey leaves on the top of the compost bin and cover it with some garden soil. Use a 2 inch layer of comfrey leaves around the plant base. The leaves will slowly break down and release plant nutrients nitrogen and potassium. Avoid using flowering stems as these can root. The comfrey mulch is good for tomatoes, cucumber, chilli, potatoes and fruit trees, but not a good match for leafy plants such as lettuce and spinach; and root plants such as beets, radishes and carrots. Rodale’s All-New Encyclopedia of Organic Gardening, An Illustrated Guide to Organic Gardening, by Sunset Publishing, and the Rodale Guide to Composting.